I first met Bakr Fahmy more than 35 years ago when I was an undergraduate from the University of Michigan living in Cairo during my junior year abroad. Since then I have visited Sakkara and stayed with Bakr and his family numerous times. I have many cherished memories of this place and the warmth and generosity of the people there. Blue Lotus Guesthouse enjoys a truly remarkable location in the shadow of the Step Pyramid on the site of the ancient capital of Memphis. The grounds are surrounded by date palms in the midst of working farmland. Many times I've awoken at dawn to see water buffalo or camels amble past my window led by people on their way to work the fields in the cool air of early morning. This unchanging pattern has been repeated in this ancient land, day after day, for over 5,000 years. You might have thoughts about such a distant time and try to imagine how life might have been then, but at Sakkara you can actually feel it. For me, the experience of connection with the past is more powerful here than anywhere else I've stayed in Egypt. The place is so beautiful, alive and yet relaxed. Here you'll find authentic country living with hospitality and delicious food. It's an experience quite unlike the one you typically find staying at an hotel as a tourist. 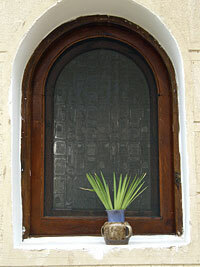 To experience the true hospitality that Egyptians show to strangers the Blue Lotus Guesthouse is a must. Located about 2 miles from the Sakkara pyramid and museum the location is excellent for visiting all the local sites without the absolute craziness of Cairo. Memphis, the Red and Bent pyramids and other less visited ( but no less spectacular) sites are very close and traveling to Giza form the lodge is much easier and more scenic than from anywhere in Cairo. We actually stayed with Bakr (Buck) and Sanna at the end of a month long trip throughout Egypt. We had just spent four nights camping in the Sinai and felt like we really needed a shower and unknown to us the baths are shared at the lodge. Being a bit frazzled upon arriving and discovering this Bakr and his wife Sanaa wanted us to stay in their home and where so incredibly gracious throughout our frustrations that we were completely charmed by their genuine efforts to make us comfortable. The Lodge is actually a converted small farm and sits in an agricultural area and is very peaceful. There are only 8 rooms or so and while not opulent are very comfortable. Considering the cost at the time was $16us including breakfast it is a great value and wonderful setting to decompress after traveling. The rooms are not large but there is plenty of room for gear and a sink is in the room which was a plus. The lodge supports many local farmers through fresh purchases of foodstuffs and grows many of the vegetables on a small plot behind the lodge for the restaurant. The dinning room was al fresco and the food was fresh and delicious. The grounds are meticulous with fruit trees and indigenous flora. Bakr has a couple of lotus flower ponds that he natures which incredibly are endangered in Egypt. Even though our arrival there was a small disaster our hosts quickly made us feel as if we were family and we even got to hold the baby by the time we left! If you want to meet and stay with locals and get a true feeling of family life in Egypt this is the place. Be ready for a slightly rustic but completely comfortable setting. We are off to enjoy an ancient Egyptian style meal prepared just for us at the Blue Lotus guesthouse. We are to be served the same foods depicted on the wall reliefs we saw in Saqqara inscribed 4,500 years ago. Bakr and his infant daughter greeted us as we arrived at the Blue Lotus. Bakr and his wife run the guesthouse mostly for visiting archaeologists working in the area. They rent a room and Bakr's wife cooks for them. Our group was very lucky to have such an outstanding cook and host. Bakr's wife is an incredible hostess, cook and bakes wonderful bread (more about that later). The baby is wearing kohl around her eyes. I was told that it helps to keep the flies away and makes eyelashes grow long and thick. It certainly makes her look exotic. We spent some time, before lunch was served, getting acquainted with Bakr and relaxing in his back yard. One thing Bakr has been doing for several years is growing the real (and rare) blue lotus. 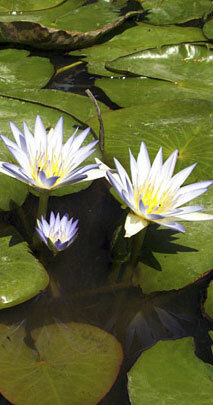 The blue lotus is a symbol of modern Egypt and the government has to issue a special permit to grow this rare plant. Bakr has several growing in his back yard. Lunch was outstanding and we all thoroughly enjoyed the food. My personal opinion was that it was the best meal I had the whole time I was in Egypt. The room through the arched doorway is the kitchen. Bakr's wife (and her sisters) had been cooking for hours before we arrived. Everything was fresh and tasted wonderful. After lunch Bakr took us on a tour of the surrounding farmland. We got a close-up look at things we had only seen in from the window of our bus. Bakr is also a farmer and was able to answer many of our questions. Like on small farms everywhere in the world, everyone helps. I When we returned from our walk to Bakr's house; we passed an outdoor beehive-shaped oven in the backyard. It looked just like the ovens we had seen painted on the walls of the tombs. As we stood around talking about it, Bakr's wife came out, fired up the oven and baked some flat bread as we watched. She had baked all the bread we were served at lunch in this very oven. I got some pictures of her showing us how she bakes the family bread every day. What a great experience. I think she was a little overwhelmed with our enthusiasm over what she thought of as an ordinary event. She and her husband were so welcoming and hospitable. What could have been just an ordinary lunch was turned into a truly memorable event.